There is a common belief in Turkey. You visit Turkey on your wish, but leave only when the host is satisfied serving you. In Turkey, serving guests is an honor. The host will treat you generously and will like to spend long hours with you like a friend. After you finish your tea and dinner, you will get fruit salad. You may guess that it is time to leave. However, your assumption is wrong. Generally, the preparation for leave begins at early hours, where guests make several pleas at gradual pace. The host will make requests to you to stay more, will engage you in several talks and will serve you refreshments at late hours. When you leave, you will find that your shoes are ready to put on. When you depart from the place, your host will say “Su gibi git, su gibi gel”. It means that your departure is like flowing water and your arrival is like gushing water. They will wish you a happy journey by sprinkling water from a pitcher. While leaving, they will also ask if there were discrepancies when you were treated. If you have relished the soft rose flavored dessert, which Britons eat during Christmas and the “Big Turk” chocolate bar from Cadbury, then your journey does not end here. You need to explore more delights in Turkey. Turkish delights are bit different from what you experience at other places. Turkish delights boast gummy, sweet appearance. A popular sweet dish of Turkey called lokum is available in various flavors. You can choose either the one like lemon, pomegranate, double roasted pistachio, or mint, which is usually coated with coconut granules or icing sugar. You will be happy to know that some cities of Turkey are recognized for their own special delights like saffron in Safranbolu and Afyon filled with chocolate chip and clotted cream. You will be surprised to know that the company like Starbuck has added Turkish delights in its offering list, with the introduction of lokum, the cubes of which are coated with chocolate. When you are in Turkey, you are going to have a different experience during breakfast. A breakfast package comprises of various vegetables including briny olives, tomatoes, cucumbers that are flavored with different variety of cheeses. Along with the vegetarian recipes, you can also find fresh baked breads that complete the serving. While you relish the main course, get energized by sipping hot cay. Many hotels in Turkey offer breakfasts in which you can experience the local jam with fresh assortments of fruits. Some forest and countryside eateries serve the guests with koy kahvaltisi, sucuklu yumurta and hot, buttery bazlama. Turkish people love to dance, when they come to know about a particular occasion. While in Turkey, you can enjoy a popular dance form called halay, which is an Anatolian line dance comprising of grapevines and pinkies steps. There are several versions of this dance form and they vary from place to place. Whether it is about the victory of a football team or the birth of a child, Turks love to express their joys by performing dance during such occasions. Once upon a time, people hailing from the northeastern province of Trabzon danced in joy to commemorate the return after long absence. During your visit to Istanbul, you will come across several occasions to experience the traditional dance and live Black Sea music at various folk bars at evening hours. Can you believe, you can reach Europe from Asia in short span of time? Yes, this is possible through ferry ride. The two-years-old Metro line Marmaray, connects two shores of Bosphorus. While resuming the intercontinental journey between Topkapi Palace and Hagia Sophia, you will be absorbed in cool breeze offering you a magical feeling. Apart from ferry ride, you can enjoy a walk to Kadikoy by making your way out of Fishermen’s Market. Enjoy the beautiful sunset at Ortakoy. If you do not want to walk, then hire a horse drawn cab to explore the Imperial City or the Prince Islands by riding a bike. When you in Turkey, you will find that the alcohol-based kolonya has multifarious applications. After you take a meal at a restaurant, the waiter will offer you lemon cologne to wash your hands. Such solvent is also sprayed on guests during reception at occasions like sacrifice and Ramadan festivals. Lemon cologne is not only used for cleaning dirty faces and hands. The smell of this solution works well to recover a person from feat. Few drops of the cologne, when rubbed through your hair, offers you a great relief from stress. You can also find the usage of this cologne during bus ride, where it is sprayed on floor and air vents, to offer you with pleasant ride during summer. Lemon cologne removes stains. Take few drops of the solution and apply it over the stain. Then light the fire and you will see that the stain has disappeared. Turkish barbers treat their clients in humble ways and provide new looks to their clients with their skills. When you visit a salon and ask the barber to offer you the sakal tirasi treatment, then, the barber will take a brush made of horsehair and a soap bar, and will whip up the brush on your face to form enough lather followed by riding of straight blade on your cheeks for removing unwanted whiskers. During the treatment, do not get afraid as the barber will light up a swab wire and hover around your face to ensure that the unwanted hairs are removed perfectly. He will perform the same act on your ear hair too. 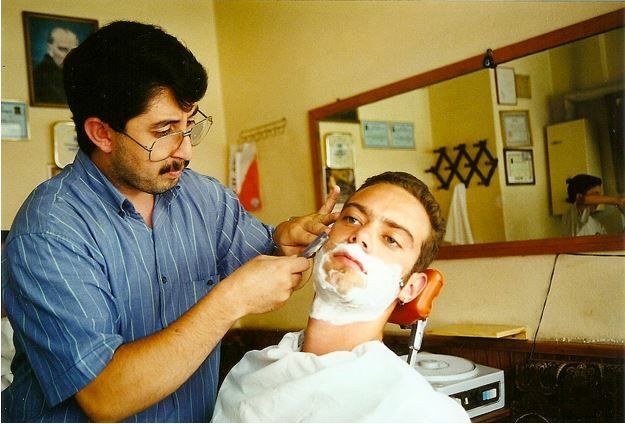 After trimming the nose hairs, the barber will perform cologne massage over your face, so that you feel refreshed in your new look. He will also blow dry your hair that will be covered with steamer cloth. At the end, pay the lira tip to the barber and enjoy your fresh look. In Turkish language, long sentences are expressed in single words. Turkish people do not waste time by pressing space bar and keep on adding suffixes into the complicated words. Look at this example, temizlettiremeyecekmişsiniz. It means that you will face difficulty in cleaning it. In Turkey, people do not refrain from work. If a shop owner orders for tea, then the concerned person will not waste any time and will reach the shop with the steaming hot tea in thin-waist tumblers. Enjoying tea is a popular practice for engaging in gossips and striking business deals. Cay, the popular tea in Turkey, brings people together every time. Cay resembles the color of rabbit’s blood and it is served with or without sugar. No pinkies or cream is added during the preparation. When you visit a carpet shop, the owner will ask you to have some cay. You should not refuse and enjoy the same. Domestic air travel is cheap in Turkey. Then also, you should opt for bus ride. Do not worry. Bus fares are as cheap as of air. During a bus ride, you will get favorable opportunity of watching the beautiful landscape. You can draw all sorts of amenities including personal TV, reading lights, Wi-Fi, etc. For refreshing yourself, you can relish Pop Kek, pretzels, Nescafe 3-in-1s, tea and the ice cream. A plateau often referred as central Anatolian region of Cappadocia is made of soft volcanic rock. The plateau underwent erosion by the actions of water and wind and attained the shape of fairy chimneys and conical pillars. People of the ancient Roman Empire built cave houses, monasteries and churches with rock. Visitors can also have a glance of watercolor artworks that were painted on ceilings of caves located in Goreme region. The sight of landscapes of Cappadocia offer excitement to visitors. Equally, the wonders lying below the earth’s surface are astonishing in nature. During 7th and 8th centuries AD, local residents, who escaped from the clutches of invaders, built underground cities like Kaymakli and Derinkuyu, the depth of which is similar to the height of a 13-storey building. These hideaways housed pantries, animal stalls, classrooms and chapels and could accommodate 20000 people approximately. Milestones were used to seal the openings of tunnels during the time of invasion. People at these underground caves silently carried out their daily activities including cooking, the smoke of which were popped out through ventilation shafts after travelling several miles away from cities. Istanbul features underground world, which you should definitely explore. During the tour, visitors can watch the ancient royal reservoir of the underground Basilica Cistern situated in Sultanahmet. Emperor Justinian built this underground empire. The Binbirdirek Cistern comprising of 1000 columns, is used as a magnificent venue for hosting weddings, gala nights and art exhibitions. During the tour, you can also experience a chilling glimpse of Anemas and Yedikule dungeons, where many prisoners were punished, who did not obey the orders of Ottoman rulers. In Turkey, it is worth watching the merry making people, who are heading down a street, grooving in drumbeats, and assisting the bride to proceed towards the marriage venue. If you are not invited for the marriage, it does not matter. You can pull out a chair and enjoy the dinner. People dancing to the tunes of halay, little bags of crackers and nuts arranged in a row for refreshment and empty plastic chairs arranged in order show that the door is open for everyone. Turks love to entertain foreigners at their wedding parties. Having a cup of Turkish coffee (Turk kahvesi) brings along with it a 40-year-old memory. It means that the guest become affectionate towards the host for kindness being showered. In Turkey, traditional coffee culture symbolizes togetherness and slow sipping. A coffee session allows the development of intimate relationship that lasts for years. Old family businesses like Fazil Bey’s and Mehmet Efendi have been running the coffee business since the Ottoman era. Currently, Osmanli, a new entrant, is engaged in targeting young generation by re-launching the coffeehouse culture with offering of Turk kahvesi in fun filled ambience. If a visitor wants to experience a bitter brew, then sipping mirra found in Southern Turkey will be the ideal choice. In Turkish language, mirra has different meanings, which are “as dark as devil”, “hot as hell”, “as sweet as love” and “as pure as angel”. In earlier days, when a person used to drink mirra, it signified that the guest would pay for the wedding or agree to marry the server. If you are not rich, then it is better that you keep the cup of mirra in your hands for the sake of courtesy, or else chances are there that a wedding ring might arrive. Coffee plays significant role in bringing people together during wedding ceremonies. When a family of a man offers proposal to a girl’s parents, for marriage, then she prepares and serves Turk kahveshi as a part of the screening procedure. If the suitor finds that the girl has added salt in his coffee and the surface lacks forth, then he should assume that the girl is not interested in him.